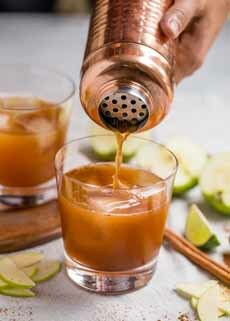 Seasonal and sweet, apple cider is a timely and delicious ingredient for fall and winter cocktails. It’s part of Union Square Cafe’s seasonal cocktail. Combined with applejack and gin, this cider cocktail is easy to make at home. Our thanks to Union Square Cafe and the Florence Fabricant/The New York Times for the recipe. The recipe can be made in 15 minutes, plus 2 hours’ chilling. Cider is a great seasonal ingredient for cocktails. Also try this Bourbon Ginger Cider cocktail from Plays Well With Butter. 1. COMBINE the first six ingredients in a jar, pitcher or cocktail shaker. Chill for two hours or longer. 2. POUR into two old-fashioned/rocks glasses filled with crushed ice. Shake a bit of nutmeg on top and add the apple slices. *The restaurant makes its simple syrup with demerara sugar. Here’s the recipe for simple syrup.